More than just an OPM icon for Christmas songs, Mr. Jose Marie Chan is now also the newest face for Shopee Philippines‘ Shopee 11.11 – 12.12 Big Christmas Sale! 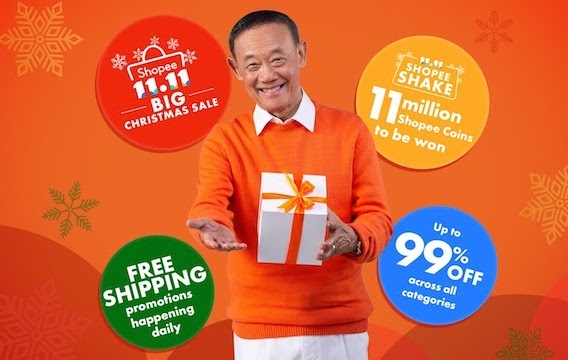 Leading e-commerce platform in Southeast Asia and Taiwan, Shopee recently announced this newest development with OPM singer icon Mr. Jose Mari Chan as their new Christmas Ambassador in line with the return of the biggest Christmas sale of the year, Shopee 11.11 – 12.12 Big Christmas Sale! Mr. Jose Mari Chan for Shopee 11.11 and 12.12 Christmas Sale! Regarded as the Father of Philippine Christmas music, the singer-songwriter made his debut as the official Shopee 11.11 – 12.12 Big Christmas Sale campaign ambassador at the kickoff event held at Glorietta 2 on October 25, where he made a special appearance and performed Christmas carols to hundreds of mall patrons. He also stars in Shopee’s current Christmas television commercial. “Christmas is a time for us to come together and celebrate. I am thrilled to be joining the Shopee family to spread cheer to all Filipinos this festive season, and to be part of Shopee’s first ever Christmas television commercial… [I] look forward to collaborating with Shopee to deliver a series of surprises this Christmas,” said Jose Mari Chan. In line with this campaign from October 26 to December 12, Jose Mari Chan fans can look forward to a series of exciting Shopee activations with him in the weeks ahead, including once-in-a-lifetime experiences such as the opportunity to sing a duet with him, receive a special dedicated song from him, or to meet and spend time with him on his Shopee Wish Bus tour. “Christmas is the most celebrated holiday in the Philippines, and Filipino shoppers are known to start their holiday shopping earlier. In line with this, we are once again bringing back Shopee 11.11 – 12.12 Big Christmas Sale, this time with an even bigger lineup of promotions. We are also honored to have Jose Mari Chan, a household name in the Philippines, join us as our first official Christmas ambassador. Jose Mari Chan embodies the Christmas spirit, and his positive and cheery personality reflects Shopee’s commitment to bringing more joy to shoppers this year-end season,” shares Terence Pang, Chief Operating Officer at Shopee. Shopee is bringing back its iconic in-app game, Shopee Shake, this time with an upsized pool of over 11 million Shopee Coins up for grabs. As a special treat this Christmas season, users will also stand a chance to win surprise Shopee Shake prizes, including roundtrip tickets to Australia, Malaysia, and Japan sponsored by Cebu Pacific. 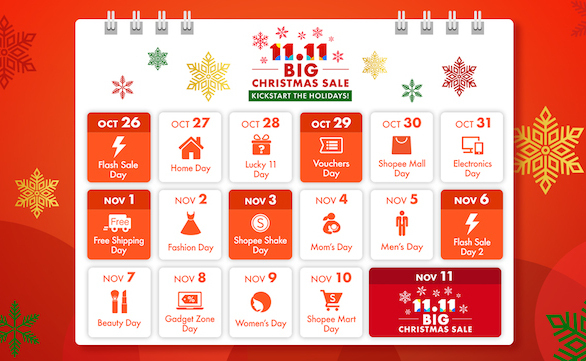 Shopee Shake will be happening twice daily, and nine times on 11.11 Shopee Shake Day on November 3 and 11.11 Big Christmas Sale on November 11. Shopee Philippines customers can look forward to discounts of up to 99% off all categories, daily free shipping promotions, and an upsized coins pool of over 11 million Shopee Coins to be won from Shopee Shake!